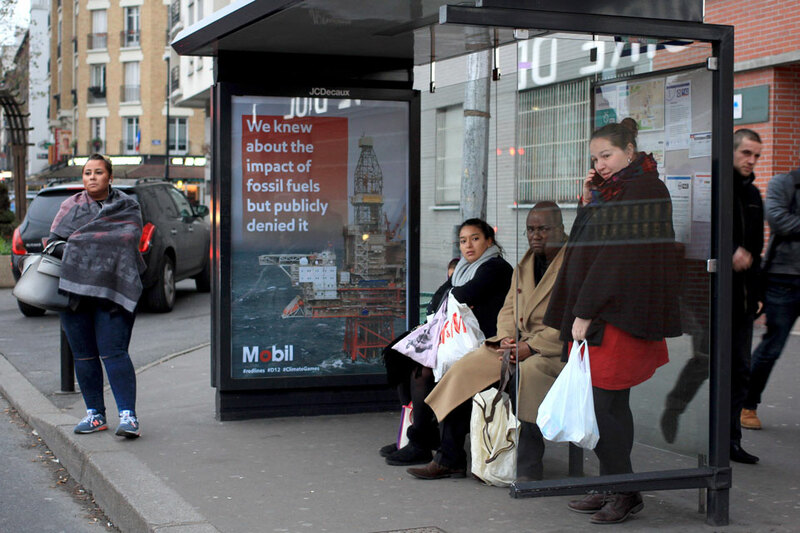 Over 600 artworks critiquing the corporate takeover of the COP21 climate talks were installed in advertising spaces across Paris last night - ahead of the United Nations summit beginning this Monday. Thousands of people are coming to Paris to demand climate justice. We can only achieve this if we remove the power of the fossil fuel lobby. That means our universities, pensions and governments must divest from dirty energy companies, and our cultural institutions must break their sponsorship ties to the oil and gas industries. Trade unionist Gilberto Torres - who was kidnapped and tortured for standing up to oil companies, including BP, in Colombia - joins a performance protest in the BP-sponsored British Museum, with Art Not Oil members BP or not BP?